Griffin Ness and Bobby Brink record hat tricks, Martin Pospisil extends point streak to 13 games, breaking a USHL record, Des Moines wins third straight game. The Youngstown Phantoms were able to earn a weekend split of their series with the Central Illinois Flying Aces thanks to a 4-1 victory on Saturday. After Central Illinois' Jeremy Davidson put his team up 1-0 after one period with his third goal of the year, the Phantoms scored the next four goals of the game. Brett Murray, Matthew DeMelis and Joseph Abate found the back of the net in the middle frame, and Jack Malone completed the scoring at 3:55 of the third period with his third goal of the season. Abate and Malone had a goal and an assist each, and recently acquired goaltender Christian Stoever made 19 saves for his first win in a Youngstown uniform. The Green Bay Gamblers picked up their second straight victory with a commanding 7-2 win over the Cedar Rapids RoughRiders. Green Bay led 3-0 after two periods with goals from Paul Maust, Jesse Tucker and Jackson Perbix. The Gamblers extended that advantage to 5-0 with early third period tallies courtesy of Noah Prokop and Chris Giroday. After Jason Polin got Cedar Rapids on the board with a power play goal at 10:54 of the final frame, Luke Mylymok and Austin Heidemann made it a 7-1 game before Ben Almquist completed the scoring with his second goal of the year just 14 seconds after Heidemann scored. Perbix (1G, 2A), Prokop, Girdoday (1G, 1A each) and Nick Leitner (0G, 2A) all recorded multi-point performances in the win, and Evan Fear continued to be strong in goal with a 15-save performance for his fourth victory in his last six starts. A four-goal third period carried the Muskegon Lumberjacks to a 5-2 road victory over the Chicago Steel, moving them to 10-1-0-0 on the season. Muskegon's Brock Bremer scored the only goal of the first period, his third of the season, to give the Lumberjacks a 1-0 lead through 20 minutes. Chicago responded with the only goal of the second, courtesy of Robert Mastrosimone, his fourth tally in his last three games, to even the game at 1-1 heading into the final frame. The Jacks scored four times in the third period, thanks to Bremer's second of the game, Nolan Sullivan's sixth of the year and the first two goals of Jack Williams' USHL career. Oliver MacDonald dished out a pair of helpers and Brandon Bussi moved to 10-1-0-0 on the season by stopping 19 of the 21 shots that came his way. After falling 6-1 on Friday to Waterloo, the Dubuque Fighting Saints earned a split in their home-and-home weekend set with their in-state rivals, knocking off the Black Hawks 4-3 at the Mystique Ice Center. A pair of Willie Knierim goals put the Saints up 2-0 through 20 minutes of play, but the Black Hawks stormed back in the second period, specifically Griffin Ness. The Air Force Academy commit picked up a hat trick in the second period to give him seven goals on the season, and combined with a Matias Maccelli goal, the teams headed to the third period tied at 3-3. 9:40 into the third period, Logan Pietila picked up the game-winning goal, his second tally of the season, to give Dubuque the eventual 4-3 victory. Knierim added an assist along with his two goals for a three-point night, Maccelli dished out a pair of helpers for a three-point performance of his own, Pietila recorded two points (1G, 1A) in the win and Aaron Randazzo made 28 saves on 31 shots for his second USHL victory. 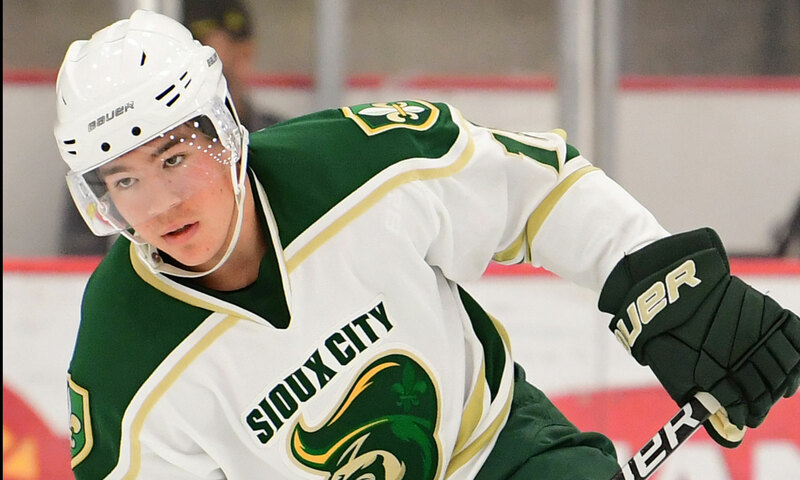 Bobby Brink scored all three Sioux City goals and Calgary Flames prospect Martin Pospisil extended his point streak to 13 games as the Sioux City Musketeers defeated the Omaha Lancers 3-2. Omaha led 2-0 after the first period, courtesy of Tyler Carpenter and a power play tally from Bryce Brodzinski. Brink scored the first two of his three goals on the night in the second period, both coming on the power play. The University of Denver commit completed the natural hat trick and scored the game-winning goal at 2:37 of the third period, giving the Musketeers a 3-2 win and keeping them unbeaten in regulation through their last four contests. Pospisil dished out a pair of assists, giving him four straight games with two points and extending his point streak to 13 games, the longest point streak to start a season in USHL Tier 1 history (2002-present). Luke Johnson added his 11th helper, the most among USHL defensemen and Ben Kraws stopped 17 of the 19 shots he saw to move to 3-0-1-0 in his last four starts and 8-4-1-0 on the season. In a defensive battle that saw the teams combine to go 0-for-9 on the power play, the Fargo Force earned a hard-fought 2-1 victory over the Sioux Falls Stampede in front of 10,000+ on Pink in the Rink Night at the Denny Sanford PREMIER Center. Following a scoreless first period, Aaron Huglen opened the scoring and got the visitors on the board at 7:16. It was the University of Minnesota commit's second goal of the season. It remained a 1-0 game until just under seven minutes had passed in the third, when Fargo's Jake Harrison doubled his team's lead. Despite a late goal from Sioux Falls' Jami Krannila, the Force were able to hang on for the 2-1 victory. Both goaltenders played well, stopping a combined 55 of 58 shots, but Matthew Sankner picked up the victory between the pipes by turning 34 of the 35 shots he faced aside for his second USHL win.